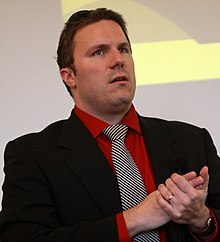 Jason F. Brennan (born 1979) is an American philosopher and political scientist. He is currently the Robert J. and Elizabeth Flanagan Family Professor of Strategy, Economics, Ethics, and Public Policy at the McDonough School of Business and Professor of Philosophy at Georgetown University. Brennan writes about democratic theory, the ethics of voting, competence and power, freedom, and the moral foundations of commercial society. Brennan grew up in Tewksbury, Massachusetts and Hudson, New Hampshire. He attended Case Western Reserve University and the University of New Hampshire as an undergraduate. He earned his Ph.D. in philosophy at the University of Arizona under the direction of David Schmidtz. From 2006–11, he was a research fellow in political science, and then Assistant Professor of Philosophy, at Brown University. Brennan is the author of Markets without Limits, (Routledge), with philosopher Peter Martin Jaworski, Compulsory Voting: For and Against (Cambridge University Press), with political scientist Lisa Hill, Why Not Capitalism (Routledge), Libertarianism: What Everyone Needs to Know (Oxford University Press, 2012), The Ethics of Voting (Princeton University Press, 2011), and, with David Schmidtz, A Brief History of Liberty (Wiley-Blackwell, 2010). His new book Against Democracy (Princeton University Press) was published in August 2016, while Global Justice as Global Freedom (Oxford University Press) with Bas van der Vossen is forthcoming. Brennan writes about democratic theory, the ethics of voting, competence and power, freedom, and the moral foundations of commercial society. His work focuses on the intersection of normative political philosophy and the empirical social sciences, especially on questions about voter behavior, pathologies of democracy, and the consequences of freedom. He argues that most citizens have a moral obligation not to vote. Brennan has appeared on the Fox Business Network show Stossel, Q&A with C-SPAN's Brian Lamb, PBS, The Mark News, and Al Jazeera English. 2016 "When May We Kill Government Agents? : In Defense of Moral Parity," Social Philosophy and Policy. 2016 "Why Consequences Matter More: The Expressivist Objection to Privatization," Criminal Law and Philosophy. 2015 "Markets without Symbolic Limits," Ethics. 2015 "Market Architecture: It's the How, Not the What," Georgetown Journal of Law and Public Policy 15. 2014 "How Smart is Democracy? You Can't Answer that A Priori," Critical Review 26: 4–30. 2013 "Is Market Society Intrinsically Repugnant?" The Journal of Business Ethics 112:271–81. 2013 "The Right to Good Faith: How Crony Capitalism Delegitimizes the Administrative State," Georgetown Journal of Law and Public Policy 11: 313–34. 2012 "Why Liberal States Must Accommodate Tax Resistors," Public Affairs Quarterly 26: 141–60. 2012 "For-Profit Business as Civic Virtue," The Journal of Business Ethics 106: 313–24. 2011 "The Right to a Competent Electorate'" Philosophical Quarterly 61, 700–24. Reprinted in Tom Lansford, ed., Opposing Viewpoints: Voting Rights (New York: Gale/Cengage2, 2015). 2011 "Condorcet's Jury Theorem and the Optimum Number of Voters." Politics 31:2, 55–62. 2010 "Scepticism about Philosophy." Ratio 23: 1–16. 2009 "Polluting the Polls: When Citizens Should Not Vote." Australasian Journal of Philosophy 87:4, 535–49. 2009 "Tuck on the Rationality of Voting." Journal of Ethics and Social Philosophy 3: 1–5. 2008 "Beyond the Bottom Line: The Theoretical Goals of Moral Theorizing." Oxford Journal of Legal Studies 28: 277–96. 2008 "What if Kant Had Had a Cognitive Theory of the Emotions?" In Valerio Rohden, et al. (eds. ), Recht und Freiden in der Philosophie Kants: Atken des X. Internationalen Kants-Kongresses (Berlin: De Gruyter), 219–28. 2007 "Modesty without Illusion." Philosophy and Phenomenological Research 75: 111–28. 2007 "Free Will in the Block Universe." Philosophia 35: 207–17. 2007 "Dominating Nature." Environmental Values 16: 513–28. 2007 "Rawls's Paradox." Constitutional Political Economy 18: 287–99. 2005 "Choice and Excellence: A Defense of Millian Individualism." Social Theory and Practice 31: 483–98. 2004 "Illiberal Liberals." Review Journal of Political Philosophy 2: 59–103. Translated into Turkish and reprinted in Liberal Düsünce [The Journal of Liberal Thought] 15 (2010), 61–89. ^ a b c "Jason Brennan". explore.georgetown.edu. Retrieved 2016-07-16. ^ "Brennan, J.: Against Democracy (eBook and Hardcover)". press.princeton.edu. Retrieved 2016-07-16.